Flip Out Mama: Novica Review and Giveaway! Beautiful Products from all over the world! Novica Review and Giveaway! Beautiful Products from all over the world! Have you ever heard of Novica? I hadn't until a few weeks ago, but I am so glad that I found them! Novica unites consumers with over 200 extraordinary master artists around the world! The products that they have are unique and beautiful! Novica provides a really cool way to find some truly one of a kind masterpieces for your home! We want you to know about who you’re buying from. We want you to feel that attachment to the product and to the hands that created it." Novica really has so many different products to choose from, it is so hard to choose! They have beautiful jewelry, apparel, home decor and much much more! They have some of the most beautiful silk scarves I have ever seen! It was so hard for me to decide what I wanted to review, but I finally decided on these beautiful placemats! Aren't they gorgeous? They were made in Bali and they are sooo pretty! They actually hand wrapped and the packaging was gorgeous! The website says they are cotton and made with "fragrant root". I am not sure what that actually means, but they smell so good! Kind of like incense and flowers. 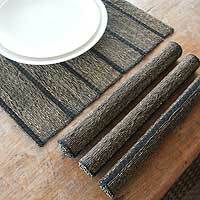 I really like these placemats and they have made a big difference in the way my table looks. Gone are the marker and crayon stains, hurray! This is Liem, the artist who made my placemats. He did a wonderful job, and I am so pleased with them! I would love to order more of his products in the future! They also have a great program called Novica Live, which is home parties where you can buy the gorgeous gifts and jewelry. It's a great way to make extra cash too! One lucky Flip Out Mama Reader will win a $40 gift code to Novica! There are so many great things that you could get with that $40! 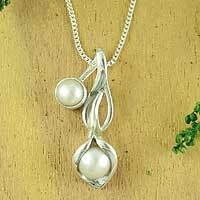 Go here to Novica's Site and tell me a product you like! +1 Follow Novica on Facebook here and tell 'em Flip Out Mama sent you! Contest will end on 9/4/2011 at approx 11:59 pm EST. Winner will be chosen via random.org and will have 48 hours to respond to email notification or an alternate winner will be chosen. Winner will receive an e-gift card in the amount of $40.00. I received a sample product in order to conduct this review. Although a sample product was received, all opinions are my own and no monetary compensation was given. I like Cotton Shoulder Bag 'Emerald Thai'. I adore the batik scarves, especially the "Blue Jasmine". Thanks for the awesome giveaway! I'd choose a set of andean panpipes. I would LOVE to have the Cedar jewelry box, 'Timeless Love'. I LOVE the HEART shape! and told them YOU sent ME!!! I love the Gemstone tree, 'Amethyst Leaves'.